316 Beacon is located on the north side of Beacon, between Exeter and Fairfield, with 314 Beacon to the east and 318 Beacon to the west. 316 Beacon was designed by Cummings and Sears, architects, and built in 1885-1886 by Thomas J. Lyons, builder, as the home of retired tea merchant Edward Royall Tyler and his wife, Jennie Louise (Cory) Tyler. They previously had lived at 369 Marlborough. Edward Tyler is shown as the owner of 316 Beacon on the original building permit application, dated November 1, 1885, and on the final building inspection report, dated December 1, 1886. 316 Beacon was built after the house immediately to the west, which had been numbered 316 Beacon. As a result, 316 Beacon was numbered 314A Beacon until about 1889, when all of the houses to the west were re-numbered as 318-332 Beacon. Jennie Tyler purchased the land for 316 Beacon on October 24, 1885, from Elizabeth Elliot (Torrey) Spooner, the widow of Daniel Nicolson Spooner, who had purchased the land from the Boston and Roxbury Mill Corporation on December 28, 1880. Elizabeth Spooner lived at 196 Commonwealth. Click here for an index to the deeds for 316 Beacon. Jennie Tyler died in April of 1890, and Edward Tyler moved to 353 Beacon to live with his mother, Martha Willis (Alger) Tyler, widow of John Tyler, Jr.. In her will, Jennie Tyler left the residue of her estate (including 316 Beacon) to Otis C. Weld and Frances E. Welch, trustees of a trust that she and her husband had established on May 8, 1889, to manage their property for their benefit and the benefit of their children. 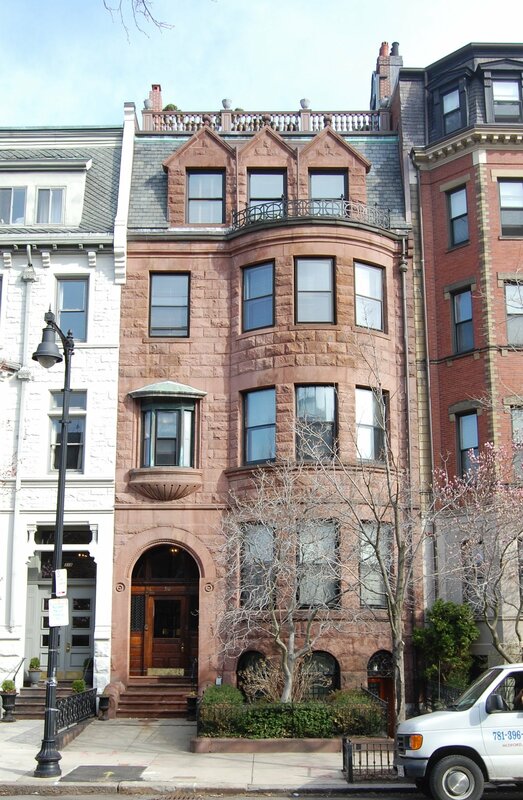 During the 1891-1892 winter season, 316 Beacon was the home of dry goods commission merchant Joseph Sargent, Jr., and his wife, Nellie Louise (McClure) Sargent. They previously had lived at 133 Commonwealth. They moved from 316 Beacon by the next season, and by the 1893-1894 season were living at 235 Commonwealth. By the 1892-1893 winter season, 316 Beacon was the home of wholesale dry goods merchant Joseph Stevens Kendall and his wife, Ellen (King) Kendall. They previously had lived at 8 Gloucester. Living with them were their son-in-law and daughter, Richard Fairfax Bolles and Mary (Kendall) Bolles. Richard Bolles was a banker and stockbroker. The Kendalls and the Bolleses continued to live at 316 Beacon during the 1896-1897 winter season, after which they moved to 305 Commonwealth. 316 Beacon was not listed in the 1898 Blue Book. During the 1898-1899 winter season, 316 Beacon was the home of attorney Charles Sumner Hamlin and his wife, Huybertie Lansing (Pruyn) Hamlin. They had married in June of 1898 and 316 Beacon probably was their first home together. Prior to their marriage, he had lived in an apartment at Haddon Hall at 282 Berkeley. 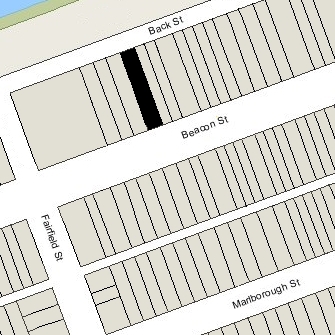 By the 1899-1900 season, they had moved to 2 Raleigh Street. During the 1899-1900 winter season, 316 Beacon was the home of Lester Leland and his wife, Frances Eugenia (Converse) Leland. They previously had lived at 1 Raleigh. Lester Leland was officer of several rubber manufacturing companies, including serving as Vice President of the US Rubber Company and treasurer of the Boston Rubber Shoe Company. They moved soon thereafter to a new home they had built at 422 Beacon. During the 1900-1901 winter season, 316 Beacon was once again the home of Edward Royall Tyler. His daughter, Edith Madeleine Tyler, lived with him. During the 1901-1902 winter season, Edward Royall Tyler and Edith Tyler moved back to 353 Beacon temporarily to live with his mother (who died in November of 1902), and 316 Beacon was the home of wholesale boot and shoe merchant William Leander McKee and his wife, Bessie (Pardee) van Wickle McKee. They had married in May of 1901 and 316 Beacon probably was their first home together. Bessie van Wickle was the widow of Augustus Stout van Wickle, a Pennsylvania coal operator and bank president. Her daughters from her first marriage, Marjorie Randolph van Wickle and Augustine van Wickle, lived with them. By the 1902-1903 winter season, the McKees had moved to 115 Bay State Road, and by the 1903-1904 season were living at 1 Gloucester. During the 1902-1903 winter season, Edward Royall Tyler and Edith Tyler were again living at 316 Beacon. Edith Tyler married in January of 1903 to Herbert Thorn King of New York City (she was born as Edith Madeleine Tyler but at the time of her marriage she was called Edith Royall Tyler). By the 1903-1904 season, Edward Tyler had moved back to 353 Beacon. 316 Beacon was not listed in the 1904 Blue Book. On January 12, 1904, 316 Beacon was purchased from the Tyler trust by Ada Medora (Whitney) Davis, the wife of George Gilbert Davis, a manufacturer of woolen machinery. They previously had lived at 243 Beacon. They also maintained a home in Kennebunkport. In 1919 or 1920, they were joined at 316 Beacon by their daughter, Dorothy (Davis) Simpson, the widow of George William SImpson, and their children. She had been widowed in November of 1918 while living at 342 Beacon, and moved to live with her parents thereafter. George Davis died in September of 1920 and Ada Davis died in December of 1920. Dorothy (Davis) Simpson remarried in August of 1921 to David Alexander Gardner and, after their marriage, they moved to her former home at 342 Beacon. On December 12, 1921, 316 Beacon was purchased from Ada Davis’s estate by her daughter, Madeleine (Davis) Powers, the wife of Dr. George Hermann Powers, Jr., a physician and aural surgeon They previously had lived at 371 Beacon. They also maintained a home in Kennebunkport and (from about 1933) also at Holiday Farm on Elm Street in Medfield, Massachusetts. In August of 1927, George Powers applied for (and subsequently received) permission to construct a one-story structure at the rear of the property for a laundry and coal storage. George Powers died in October of 1941. Madeleine Powers continued to live at 316 Beacon until about 1946. The house was shown as vacant in the 1947 City Directory. On June 6, 1947, 316 Beacon was purchased from Madeleine Powers by Benjamin Adroy Buzzell and his wife, Henrietta M. (Schacht) Buzzell. They previously had lived at the Hotel Somerset and, before that, in Belmont. He was sales manager of a wholesale coal and oil company. In September of 1947, he applied for (and subsequently received) permission to convert the property from a single-family dwelling into six apartments. In November of 1947, he applied for (and subsequently received) permission to add a two-car garage at the rear of the property. The garage was designed by architect Clark F. Merrick, who lived in one of the apartments in the late 1940s. Benjamin Buzzell died in July of 1965 and Henrietta Buzzell moved thereafter to Florida. On October 4, 1967, 316 Beacon was acquired from Henrietta Buzzell by the S. S. Ganick Corporation (Saul S. Ganick, treasurer). On March 31, 1970, 316 Beacon was acquired from the S. S. Ganick Corporation by Donald Arthur Flaherty and his wife, Marion Louise (Taylor) Flaherty. He was a real estate manager and former television news editor. They moved to one of the apartments at 316 Beacon; they previously lived in an apartment at 228 Beacon. On April 26, 1982, 316 Beacon was purchased from the Flahertys by Jerald R. Feldman, trustee of the Riverside Realty Trust. 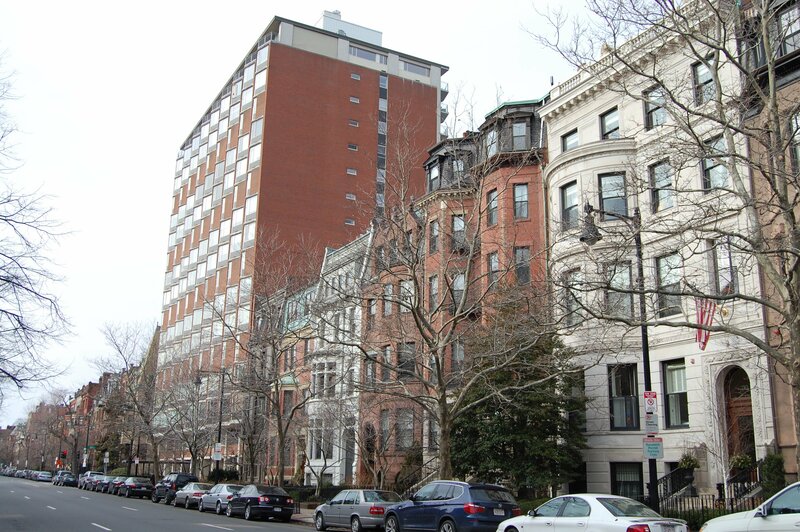 On January 13, 1983, he converted the property into six condominium units, the 316 Beacon Street Condominium.